David J. Stewart Pleads Guilty to Child Abuse | David J. Stewart Exposed! We originally posted an article on July 28, 2009 that detailed the criminal sexual conduct charges against David J. Stewart. While there are MANY who are grateful to us for bringing this information to light and exposing David Stewart's dishonest and hypocritical behavior, there are some who doubt the charges against David are true. 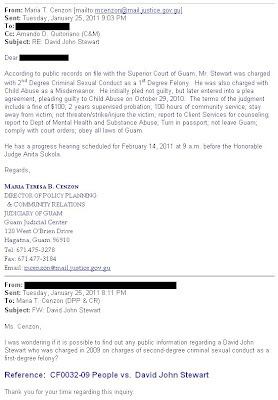 New information directly from Maria T. Cenzon, Director of Policy Planning and Community Relations at the Guam Judicial Center, confirms that the information we originally presented to you is entirely true. Of special note are the new details about the case. In addition to the charges against David J. Stewart for 2nd Degree Criminal Sexual Conduct as a 1st Degree Felony, David Stewart was also charged with child abuse as a misdemeanor. He denied the initial charges but later plead guilty to child abuse as part of a plea agreement. 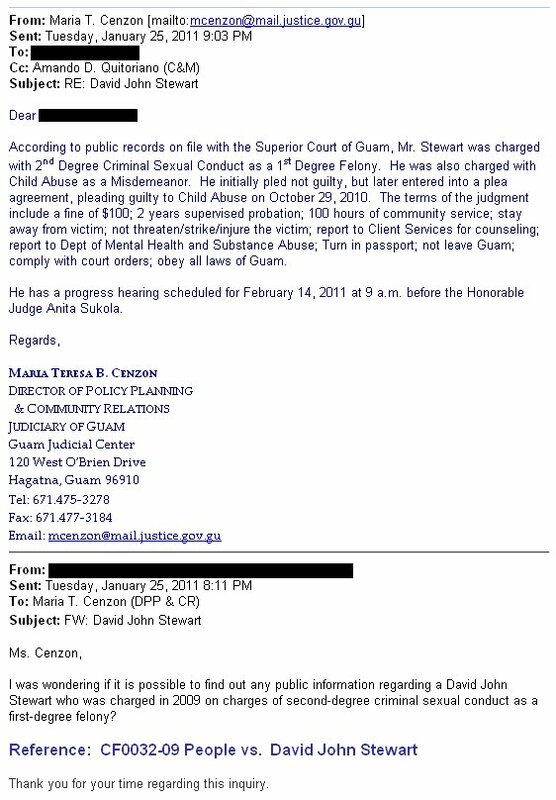 According to public records on file with the Superior Court of Guam, Mr. Stewart was charged with 2nd Degree Criminal Sexual Conduct as a 1st Degree Felony. He was also charged with Child Abuse as a Misdemeanor. He initially pled not guilty, but later entered into a plea agreement, pleading guilty to Child Abuse on October 29, 2010. 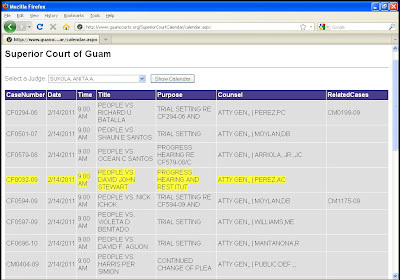 The terms of the judgment include a fine of $100; 2 years supervised probation; 100 hours of community service; stay away from victim; not threaten/strike/injure the victim; report to Client Services for counseling; report to Dept of Mental Health and Substance Abuse; Turn in passport; not leave Guam; comply with court orders; obey all laws of Guam. He has a progress hearing scheduled for February 14, 2011 at 9 a.m. before the Honorable Judge Anita Sukola. I was wondering if it is possible to find out any public information regarding a David John Stewart who was charged in 2009 on charges of second-degree criminal sexual conduct as a first-degree felony? Thank you for your time regarding this inquiry. 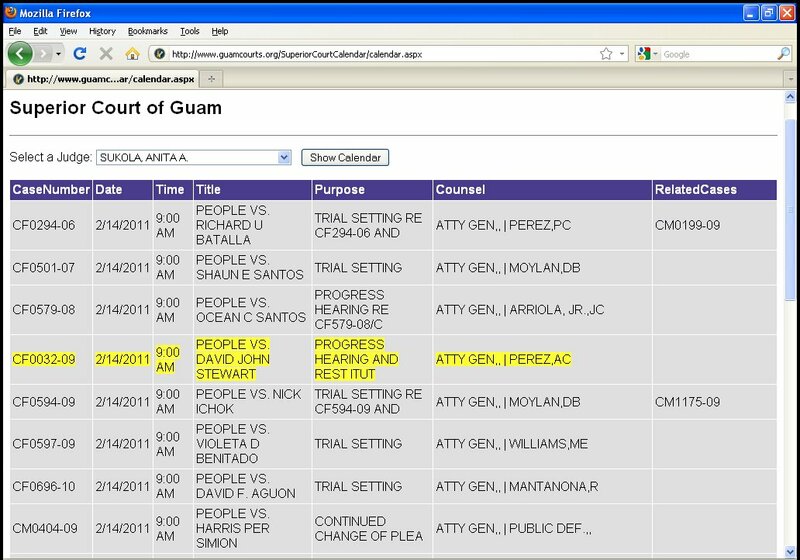 In the "Select a Judge" dropdown, select SUKOLA, ANITA A. and click "Show Calendar"
This information regarding CF0032-09 People vs. David John Stewart is publicly available via the Superior Court of Guam, according to Ms. Cenzon. Nothing we have shared here in this article or in prior articles is private or restricted information. David Stewart has consistently ignored the information we have presented up until now, choosing to make it appear that it has never happened. He had removed all evidence from www.jesus-is-savior.com that confirms that he is the same David J. Stewart currently involved in the CF0032-09 People vs. David John Stewart case in Guam. David cannot hide, however, the publicly available evidence that is accessible via the Superior Court of Guam. He also cannot remove the text of previous "snapshots" from his site that appear on The WayBack Machine. Any content that he has removed to hide evidence is still easily found by searching for his altered pages using dates prior to when we published about that evidence. David Stewart claims to be a Christian and uses his web site to "preach" to the public about the evils of sexual immorality, adultery, etc. As this and previous articles show, he is being a hypocrite by doing the same things he preaches against and is trying to hide this information from you. He is in no position to be trying to teach the Word of God to the public. David falsely accuses many of deception yet he himself is a clear example of what deception truly looks like and how Satan can mix bits of truth with error to deceive the nations.